A collection of our most sought-after chocolate recipes matched with a 500ml bottle of our Chocolat Cream Liqueur. We melted our chocolate into mouth-warming vodka and cream. Pour over ice and pair with our finest recipes. 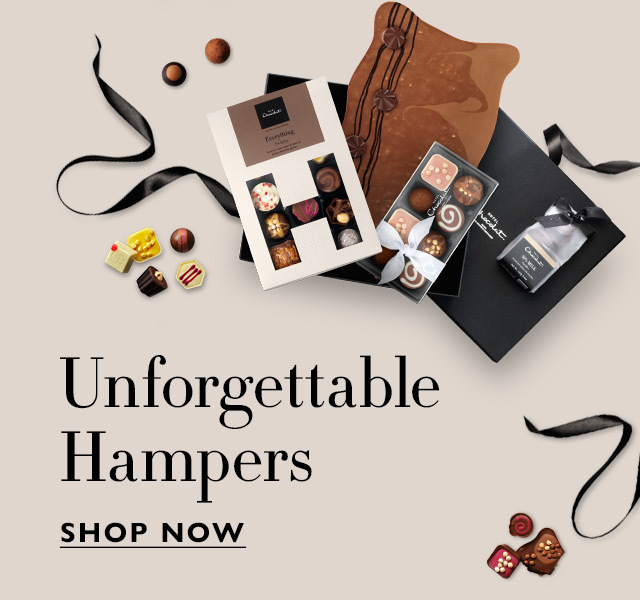 Inside the Classic Chocolate Cabinet authentic Champagne Truffles made with the real thing, our pressed fruit in intensely smooth high cocoa butter white chocolate, brooding dark pralines: there’s something for everyone in this sumptuous selection. Ready to gift in a ribbon-tied bag. Chocolate Cream Liqueur. Once opened, store refrigerated. Consume within 6 months of opening. Classic Signature Cabinet contains: Ingredients: cocoa solids (cocoa mass, cocoa butter), sugar, full cream MILK powder, marzipan (ALMOND NUTS, sugar, water, invert sugar syrup), stabilisers (sorbitol, glycerol), runny caramel (glucose fructose syrup, sweetened condensed MILK, half salted butter (from MILK), sugar, salt, emulsifier (SOYA lecithin), water), sticky toffee sauce (sugar, cream (from MILK), butter (from MILK), flavourings), butter oil (from MILK), HAZELNUT paste, glucose syrup, sweetened hazelnut paste (HAZELNUTS, sugar, emulsifier (sunflower lecithin)), skimmed MILK powder, whipping cream (cream (from MILK), stabiliser (carrageenan)), HAZELNUTS, PECAN NUT paste, fruit juice concentrates (mango, strawberry, blackcurrant), half candied cherries (cherries, liquor, kirsch), amaretto, pistachio paste (PISTACHIO NUTS, rapeseed oil), PEANUT paste, rum, vegetable oils (palm, rapeseed), icing sugar, emulsifiers (SOYA lecithin, sunflower lecithin), walnut paste (WALNUTS, sunflower oil, citrus fibre, emulsifier (SOYA lecithin)), nibbed PECAN NUTS, neutral alcohol, cream (from MILK), nibbed HAZELNUTS, gin, desiccated coconut, dextrose, passionfruit puree, whole MILK powder, meringue pieces (sugar, non-hydrogenated vegetable fats (shea, palm oil), WHEAT starch, EGG white), invert sugar syrup, MILK fat, flavourings, champagne (SULPHITES), lime puree, sunflower oil, freeze dried strawberry powder, organic cocoa powder, ALMOND NUTS paste, caramelised sugar, concentrated whey (from MILK), cereals coated with chocolate (crisped rice (rice flour, sugar, cocoa butter, salt), sugar, cocoa solids (cocoa mass, cocoa butter), whole MILK powder, whey powder (from MILK), butter oil (from MILK), vegetable fat, glazing agents (gum arabic), glucose syrup, modified starch (potato, maize), emulsifier (SOYA lecithin), flavouring, spices), natural colours (beetroot, carotene, annatto, paprika, anthocyanin), acidity regulator (citric acid), freeze dried strawberry pieces, sea salt, dried mint, essential oils (lime, orange), MILK protein, concentrate of spirulina, vanilla seeds, vanilla extract. Chocolate Cream Liqueur: Contains MILK. For allergens, including cereals containing gluten, see ingredients in BOLD. May contain traces of other tree nuts and sesame. Serving size (2 pieces): 20.7g. Pack contains approx. 29 servings. Country of Origin: Classic Cabinet: United Kingdom.